The Salesforce Service Cloud Consultant Certification is intended for Salesforce experts who specialize in designing contact center solutions that make use of cases, knowledge base, and portals, designing interaction channels and building interfaces to maximize agent productivity, and managing data and design analytics that track key industry metrics. The Salesforce.com Service Cloud Consultant exam is designed for implementation experts who have experience implementing Service Cloud solutions in a customer-facing role. The Salesforce.com Service Cloud Consultant is able to successfully design and implement Service Cloud solutions that meet customer business requirements, are maintainable and scalable, and contribute to long-term customer success. I passed my Salesforce Service Cloud Consultant certification on the Winter ’13 release. By the time I took the exam, I was working with the Salesforce platform for a bit over a year and a half. However, I had very little experience working with the Service Cloud at the time. This exam required a large amount of studying to be prepared. Mark every question you aren’t 100% certain on. Remember, you only need 41 questions correct to pass, so if you only mark 15, you are good to go! As you can see above, the Service Cloud Consultant certification is part of the Administrator tree. This means you must complete 3 Administrator maintenance exams a year to maintain your certification. The maintenance exams are relatively simply, usually 10-15 questions related to the latest release. Your best bet is to read the release notes and watch the release webinar. In my personal opinion, the Service Cloud Consultant exam was by far my most difficult certification. It was the only certification I have taken where I wasn’t sure when I clicked “Submit” that I was good. I would highly suggest studying for 20+ hours and having at least 1 Service Cloud implementation under your belt. 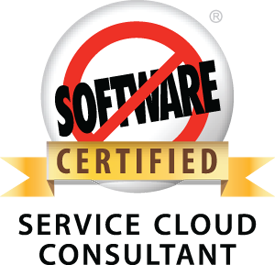 It is not an easy certification and it requires a thorough understanding of the platform. With that said, it is incredibly valuable information to have. When you are ready, give it a shot. Good luck! Everything I have is above. I don’t have any sample questions. Good luck! What’s the recommended workflow to obtaining SF Service Cloud Certification? Do I need to take the Admin course first, and then study and register for the Service Cloud exam? If it is recommended to take the Admin course, is the Implementation course also necessary? Thanks! @Shekhar Getting away from things , doesn’t help for next . Better for now you can go for Advance Admin Certification. Please go through the above mentioned links, These are really very helpful .